Oracle Universal Installer creates the directory path that you specify under the Oracle base directory. It also sets the correct permissions on it. You do not need to create this directory. During installation, you must not specify an existing directory that has predefined permissions applied to it as the Oracle home directory. If you do, then you may experience installation failure due to file and group ownership permission errors. From the Start menu, choose Programs, then Oracle - HOME_NAME, then Oracle Installation Products, then Universal Installer. When the Welcome window appears, click Installed Products. 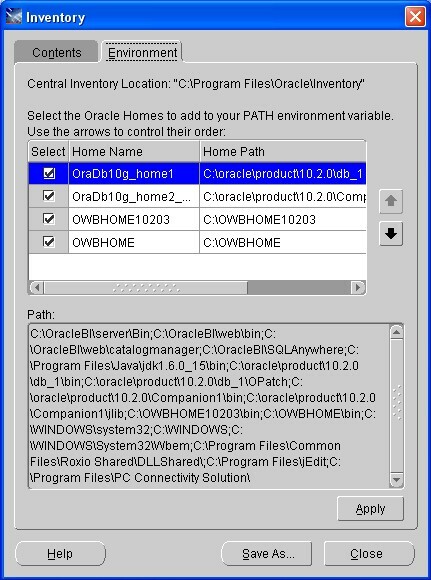 The Inventory window appears, listing all of the Oracle homes on the system and the products installed in each Oracle home. If possible, choose a directory path similar to the first one (/u03/app/oracle). This path complies with the OFA guidelines.